You can now sweeten your drinks anywhere you go. 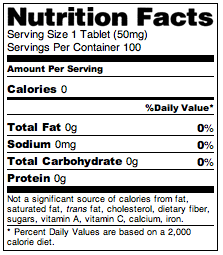 Stivii tablets are calorie-free and allow you to finally put the sugar on the side. These natural based mini tablets, made up of the sweetest and best tasting part of the Stevia leaf, offer you an ideal way to sweeten your tea or coffee without an ounce of guilt. Inulin, Steviol Glycoside (97% REB A), Erythritol, Croscarmellose Sodium, Magnesium Stearate, Natural Flavors.